Many years ago when hunting and gathering was the means to survival, the ability to shore up vast amounts of caloric intake as body fat conferred an evolutionary advantage. The thinking goes that this adaptive mechanism of storing excess energy allowed some individuals to survive long enough during periods of food scarcity to pass on genes to their progeny. Millions of years later, our expanding waistlines are a sober reminder that the human body’s metabolic and physiologic programming lags behind advances in 21st-century food production. We seem stuck in a Paleolithic time warp, with a mismatch of biology and environment that makes it nearly impossible to avoid gaining weight. Add to this mix a sedentary lifestyle, large meal portions and lack of physical activity, and you have the perfect recipe for obesity. 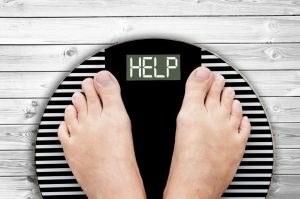 In spite of the glut in weight loss diets, pills and guides, why do thousands of people struggle to keep off the extra pounds they lose? The answer, according to a recent study, has to do with the body’s resting metabolism, which works like a thermostat. After severe weight loss, how many calories a person burns at rest slows down significantly. The body fights back to restore the initial weight. The more weight lost, the fewer calories the body burns at rest so more energy can be stored as fat. By studying contestants from The Biggest Loser, a popular TV show about weight loss, researchers at the National Institute of Health think leptin may be behind this tug of war. Leptin is a hormone that regulates hunger, and its levels decrease dramatically with weight loss. Vigorous exercise blocks leptin signaling, which the hypothalamus interprets as starvation. This puts the body in perpetual hunger mode and explains the persistent hunger cravings when trying to lose weight. Aging further compounds this problem by slowing down resting metabolism even further. Leptin, however, is just one of many factors that control our caloric consumption. In one of my class discussions last week, Barbara de Lateur, a professor in the Department of Physical Medicine and Rehabilitation, who runs a weight loss, exercise and health improvement clinic at Johns Hopkins, stated that “fat is tightly regulated by the body in a balancing act between body composition, type of calories consumed, resting energy expenditure, genetics, exercise and the thermic effect of food (energy cost of metabolizing various food nutrients).” By implication, losing weight and sustaining it requires a multifactorial approach. In her clinic, de Lateur reviews self-documented logs of patients’ caloric intake and baseline physical activity, and then helps design individualized regimens suitable to their needs and goals. I’ve gleaned a few pearls of information from her clinic. One important tip is that skipping breakfast means a failure to rev up one’s caloric expenditure for the day, since breakfast jump-starts our metabolic engine to burn calories. Regarding weight loss, popular diets and diet pills simply do not work. Rather, the goal should be to eliminate processed foods and sugars from your diet because they contain no nutrients and provide you with a surplus of calories. The body handles this by converting the excess calories to fat. For individuals with a sedentary lifestyle, consuming these excess empty calories ultimately leads to weight gain due to fat deposition. Exercise and physical conditioning are also essential for weight loss maintenance by changing body fat composition and improving energy expenditure. During exercise, the sympathetic nervous system sends signals to muscles to make new mitochondria to burn more energy. Mitochondria are little engines that help our cells to run. Over time, mitochondria get worn out and need recycling. By clearing out old mitochondria, exercise enhances high cellular functioning. Exercise also improves how well the body reacts to high blood sugar levels by releasing insulin. Individuals who are insulin-sensitive require smaller amounts of insulin to lower blood glucose levels. When this process fails, there is an increased risk of diabetes, which has been has been linked directly to obesity. As scientists work to figure out answers to the obesity question, solutions may lie in re-engineering of a dysfunctional metabolic system. Recent work from Psychiatry researcher Kellie Tamashiro has given new meaning to the old saying ‘you are what you eat.’ She’s also found evidence to support an important corollary: you don’t have to be what your mother ate. Read more. Dr. Carolyn Wang discusses the link between obesity and sleep problems. Learn more. 2 Comments on "The Biggest Loser and the Skinny on Obesity"
Very insightful article about what goes on in our bodies as a result of our actions. Thank you Charles! thanks for reading, and for your comments, Courage!